I am working on another colour-block hooking inspired by Ton Schulten’s work. 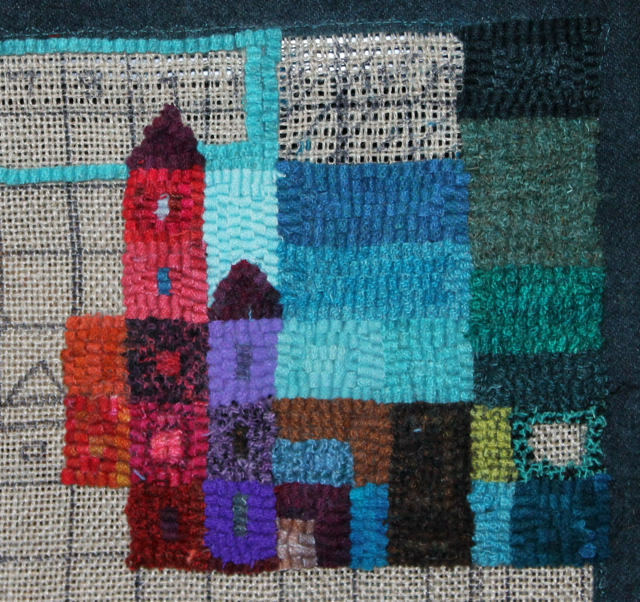 I’ve drawn a one-inch grid on the linen and am hooking the buildings in warm colours and the background in cool. You can see where I’ve had to pull sections out that didn’t work and start again. It is challenging to combine the values and hues into a cohesive piece with the buildings as a focus and the sky and ground as a frame. At this point, I’m not sure if it’s coming together or needs more modification. I’m going to plunge ahead and, if you want to come along, I’ll post again later in the week and we can see where it goes. Yesterday I was in Kingston to meet my son for lunch at the Juniper Cafe in the Tett Centre. I love this spot, right on the shore of Lake Ontario. And I love having an hour to spend with my son. After he went back to work, I stood on the main level and sketched this from the huge window there. 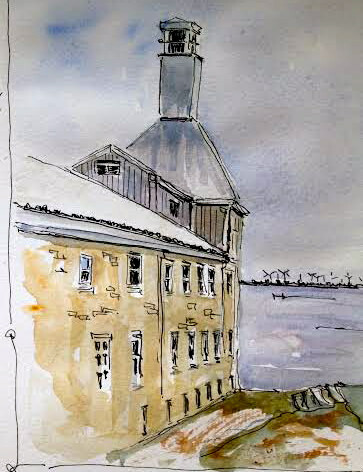 The building is the old Morton distillery, a limestone structure from the mid 19th Century. The site is now home to all sorts of creative types. It’s a wonderful space in the heart of the city–a great place to spend an afternoon. Today is Family Day in Ontario and we were lucky to have all our family home on the weekend. 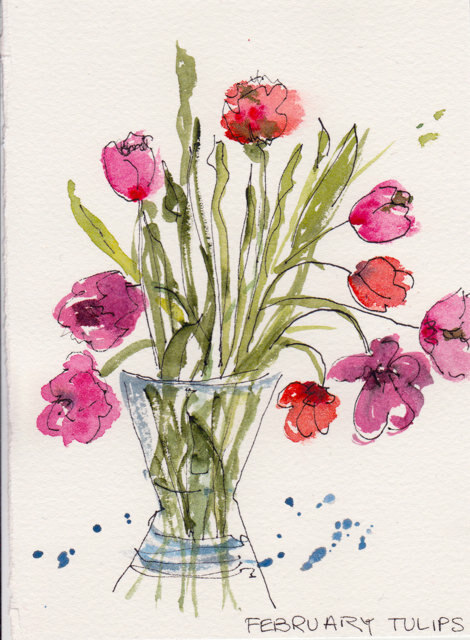 These tulips were painted during a brief respite in the activities–in celebration of family and the joy of having them all together for a little while. Here is another little mat done in the style inspired by Ton Schulten. I put a grid on the linen this time to help with the design. Hooking in this style is a great lesson in composition–lights/darks and brights/dulls. I didn’t leave room for borders on the sides as I was hooking on a small piece of backing–a mistake. I also tried varying the sky in colour blocks, but it seemed in this small space that it overpowered the designs. Next steps: I think this style would work well for a pillow. I like the quirky geometric pattern and the pops of colour. Enough ‘sketches’ for now. I’m taking a fresh piece of linen and planning out a larger rectangular design. I’ll show you when I have it on the backing. We are dealing with the aftermath of a big ice storm in Southern Ontario–but in my studio, I’m thinking of spring. 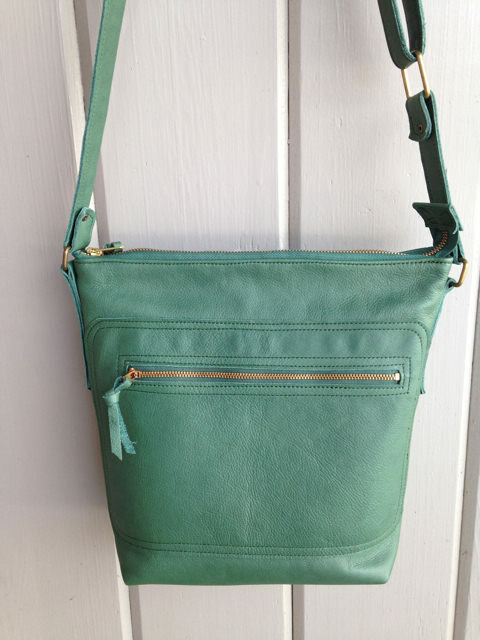 I’m working on new Keller bags in beautiful blue-green leathers. Here is the first one: it has a generous zipper pocket on the front and inside a large canvas pocket with birdbrain graphics and a large leather pocket for your phone. 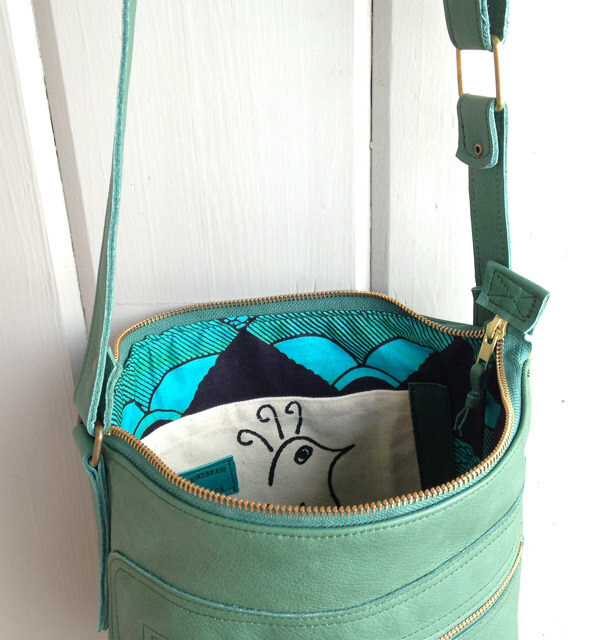 The lining is my favourite Kenyan cotton–layers of turquoise, green and black circles and triangles. 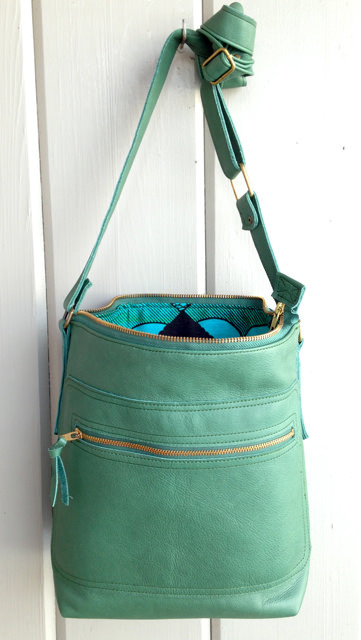 The bag is a great size for everyday use: 11″ tall, 12″ wide and 4″ deep. It has durable metal zippers and a double leather bottom so it is ready for all your carrying needs. This bag and others will be in the online shop next week. Sometimes an idea for a project swirls around in my head for years before it comes to fruition. Here is the beginning–a small mat I’ve just finished, inspired by the work of Ton Schulten. I’ve been thinking about this for a long time. My wedding rug, completed in 2012 was a start. 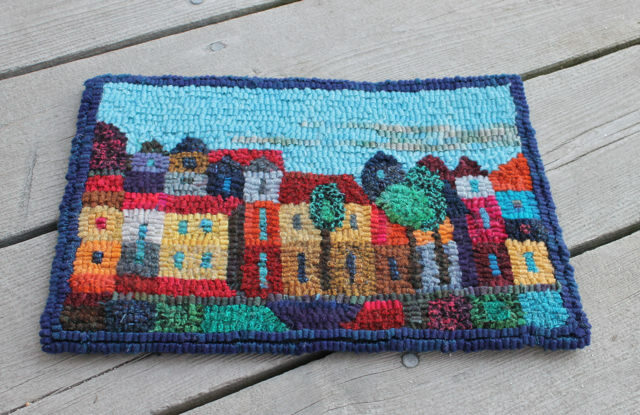 But for this one, I set out to understand his use of colour and value and to learn how I could take this into rug hooking. The impetus now for this piece is a project for a study group where I am to hook a larger piece inspired by his style. This is the first ‘sketch’. But there is a sad note to all of this today. In the process of learning about Schulten’s colour block style, I discovered the work of quilter Ineke Berlyn. Her book, Landscape in Contemporary Quilts, which I bought and read in 2009, describes her discovery of Schulten’s work and her journey to creating landscape quilts based on the style of his paintings, “a bright picture-postcard centre…offset against shades getting darker towards the borders.” (p.25) I loved the pieces Ineke created and followed her development of the style on her blog. It was with sadness that I saw today that Ineke died just yesterday. I encourage you to visit her blog and look at the many online images of her work. 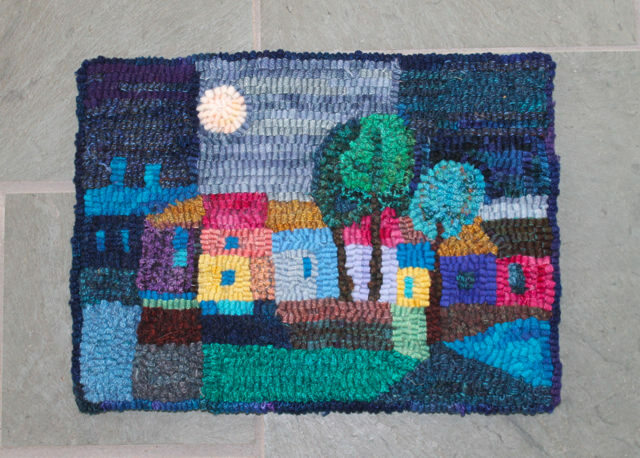 It’s amazing how we form bonds with other textile artists online, and although we have never met them, feel so saddened by the passing of their creative light.